By Dr. Sol Silverman, Jr.
Cancer is one of the scariest words in our language. If you're one of a growing number of people determined to take an active role in your health care now and in the future, you'll want to learn what you can about one of the principal killers in developed nations today. Knowledge is power; let's arm ourselves with as much knowledge as we can. 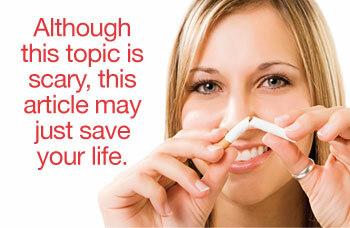 We will begin with an overview then apply the information to a more specific type: oral cancer. Cancers are a class of diseases characterized by the uncontrolled division of cells and the ability of these cancerous cells to spread. They can grow into nearby tissue through a process known as invasion, or they can be transported through the bloodstream or lymphatic system (a complex system of glands and ducts active in the body's defense against disease), to distant areas by what is called metastasis. I'll attempt to provide what we know today about this major threat. The scary aspect of oral cancer is that it's not usually detected until a late stage. There are many types of cancers; how severe the symptoms are generally depends on the nature of the malignancy, which refers to cancerous cells that usually have the ability to spread, invade, and destroy tissue. Most cancers can be treated and some even cured, depending on the type, location in the body, and at what stage the cancer is diagnosed. However, once diagnosed, cancer is usually treated with a combination of surgery, “chemotherapy” (drugs which destroy cancerous cells) and “radiotherapy” (killing cancerous cells with radiation). How is a Normal Cell Transformed? they may be passed down from one cell generation to the next. risk factors — conditions or behaviors that increase the possibility of disease e.g. smoking, chewing tobacco and alcohol use, diets low in fruits and vegetables, viral infections — primarily the human papilloma virus “HPV 16” (the same one that's been in the news lately which causes cervical cancer in women), and an immune (protective) system that is not functioning normally in response to infections or inherited disease. Now that we have more of a background about cancer, its causes as well as its risk factors, let's take that knowledge and apply it to a specific area, the mouth. Oral cancer accounts for roughly 3% of all cancers in men and 2% in women. Men still outnumber women 2 to 1, but this is changing as women become more exposed to the same risk factors as men. Like all cancers, oral cancer is associated with aging. Did you know that more than 90% of all oral cancers occur in individuals over 40? We now know that African-Americans have a higher incidence than Caucasians and a disturbing number of cases in young people regardless of ethnicity, have been seen in recent years. the pharynx (back of the mouth and throat). You might say that the mouth and lips are accessible for direct examination all the time by routine visits to the dentist. Thinking along those lines, it's probably easy for a dentist to notice anything unusual in the mouth within a matter of months, right? Here's the scary aspect of oral cancer: it is not usually detected until a late stage. So despite all the advances in treatment, survival is poor, with only 58% surviving 5 years after treatment. Most oral cancers are “squamous” (small scale-shaped) cell carcinomas, occurring in the lining of the mouth and are often preceded by identifiable surface changes (lesions) of the oral membranes. White or red patches begin to form in the pre-cancerous stage, and as the cancer develops, a non-healing ulcer may appear. Authored By: Dr. Sol Silverman, Jr.